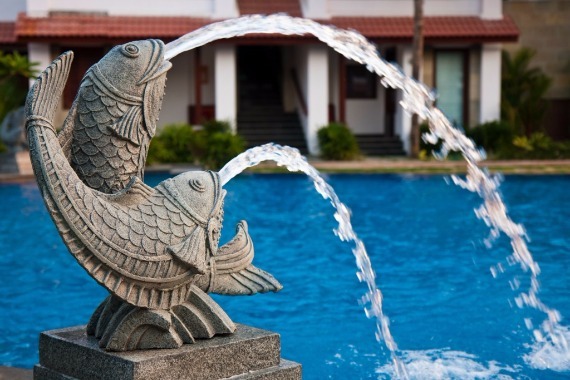 Jets, fountains, and other water features are popular in both residential and commercial swimming pools, as they bring interest, creativity and beautiful design to the waterscape. They may look lovely, but they play a large role in the evaporation process, which can increase water and heat loss, and energy consumption in heated swimming pool. Features like these can also make it difficult to keep your swimming pool covered, but don't worry, there is a solution! Evaporation occurs quicker, however, when there is movement on the surface of the water. When water evaporates, it doesn't just disappear. It turns into vapour and hovers above the water it just left - this is humidity. In very simplistic terms, depending on how dense the humidity is directly above the water surface, there may or may not be more room for additional vapour to rise. The higher the humidity levels, the less the water will evaporate because there is no where for it to go. However, the lower the humidity, the higher the rate of evaporation, because the water vapour has plenty of room to rise and escape. Even the smallest bit of water movement - from the jets or water features - disrupts the humidity directly above the water's surface and gives the vapour space to escape, thereby increasing the rate of evaporation. Water movement from splashing and jets and water features also increases the surface area of the water, giving more surrounding space for the water to escape to. Only the topmost water molecules have the chance to evaporate at any given time, so allowing more water to be topmost increases their chances at becoming vapour and leaving your swimming pool behind. If this all seems a bit too complicated, I get it. I have been in the pool industry for almost 10 years now, and it still makes my brain spin a little bit. But I have seen the proof over and over again as pool owners and operators come to us for a solution to this problem. Evaporation increases pool water refill levels, cools the water quicker, and increases the cost of heating the pool. Traditional pool covers can help reduce evaporation drastically but in these situations there are two main problems: 1) they don't usually fit nicely around water features, and 2) with gorgeous water features, no body wants to cover up the pool! Liquid pool covers, on the other hand, fit just as easily around any pool feature and do not detract from the aesthetics of the pool environment in the least! They do, however, reduce evaporation rates by up to 50%, saving water, retaining heat and conserving energy along the way. Another great benefit is that they're incredibly easy to use! An automatic metering system can be installed to make dosage automatic, ensuring your pool is covered 24/7 with little to no effort on your part...and absolutely no disruption to your daily pool activities!